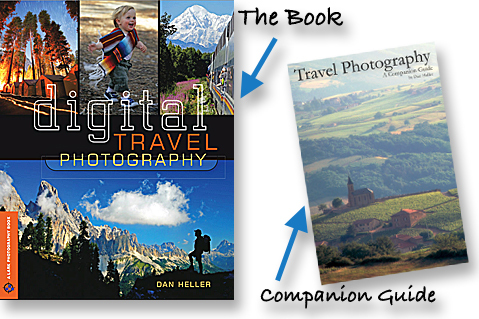 Dan Heller's Photography Business Blog: My new book arrived! Buy one here and get a free companion guide! So, you think I write long, boring articles, full of dense analysis of the photo industry, do ya? And I bet your eyes roll when your RSS feed tells you that a new article is ready. And you probably tell the office supply guy to go fill up the printer toner and buy a new ream of paper so you can print out my latest manifesto for the long commute home on the train, right? Well, my esteemed colleagues in the photo field, that isn't going to happen this time. Believe it or not, I do have other, non-boring creative writing techniques that I picked up somewhere between the 7th and 8th grade, much to the dismay of the school janitor who had to clean it off the gym wall every other morning. In fact, I have dumbed down my writing to a level that even politicians can understand. I even went so far as to deliberately avoid words no more than 6 letters long, unless I had no choice, in which case, I reduced the font to make them not appear so big. So, what's the topic of my new diatribe? By merely examining the graphic on this page, you may surmise that I actually take pictures for a living. And to that, you would be correct! Lark Books has humored me by agreeing to actually print the pictures I take on these fabulous trips other people foolishly pay me to take. The only thing required of me was to explain how I take pictures. What's my technique? How do I get these (ahem) fantastic photos that I sell for astonishingly and indefensibly large sums of money on my website? Well, now, you can find out. And your brain won't fry when you read this stuff either. I don't talk about anything that has to do with money, economics, business, or nothin'. Just good ol' photo techniques. 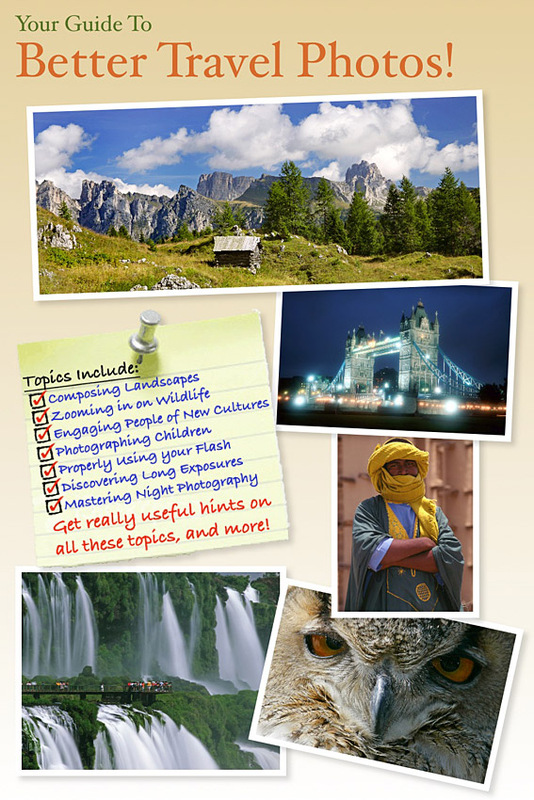 Specifically, travel photography. And best of all, there are pretty pictures to look at, too! From all over the world, no less! Haven't had enough senseless marketing rhetoric? Then keep reading! Now you can obtain a copy (or two) for yourself or loved ones by ordering directly from my website using this link for the deep-discounted price of only ... wait, I gotta go look it up... twenty smackers! That's about twenty dollars for you non-American folks. Oddly, that's about the same price in Canada, eh? And you Europeans, you have no excuse whatsoever. You could be my entire supply for just a few Euro! And you Brits, our measly little dollar is hardly worth half your quid. And talk about photos! There are well over 200 pictures that, if you were to license each one from my site, I'd charge you several hundred dollars each! That would make this book worth... let's see, that's 234 pictures times $364/each on average... carry the one... well, let's just say that it'd be a lot of money! What savings! Available only on my website, you will also get a totally free Companion Guide. (Remember, "free" is not nearly as good as "totally free.") Yes, this little 36-page booklet is like a "cliff's notes" version of the longer book, making it perfect for taking along with you on those big trips where you need to travel light. Yours truly designed and produced this little booklet all by my little self during those wee hours of the morning while waiting for the next silly thing to happen in the photo industry that I could write about. So, wait no longer, order now, and be the first on your block to have it in the recycle bin for thursday's pick up. Or, donate it to your local library. And be sure to tell your friends, neighbors, relatives and anyone else that is looking for a quick, easy gift to give that emerging photographer as a gift. Now, pardon me while I go get more coffee.